An intensive 3 day early season ski touring skills weekend, for learning new techniques and brushing up on avalanche safety training. This is an ideal Haute Route training course, or makes good preparation for joining a multi day hut to hut tour later in the season. We had a lot of good skiing and learnt a load of useful stuff. Jack and Toby are now converts and are talking about doing a tour next year. James was brilliant covering all the aspects of ski touring whilest taking us to some amazing places. We managed to traverse the Vallee Blanche to Pt Helbronner which for Toby and Jack was a real eye opener as they had never been in the high alps before. Personally I learnt loads, particularly beneficial was the morning spent learning and practicing crevasse rescue. The hotel was lovely with Delphine giving us a warm welcome. Can you pass on our thanks to James from all of us for a great three days. The weekend ticked all the boxes for me, James was excellent in all respects. The weather Sunday was not great but we made best use of the day, the crevasse rescue techniques was very new for me and a highlight of the weekend despite the weather. Accommodation good too, very friendly, good food and good company in Pete and his family. All in all 10/10. Hi Rich – we had a thoroughly excellent time. The skiing was amazing and the new skills we learnt were really well taught and coached by Gav. Gav was a very reassuring guide who covered what we needed to learn very well and also took us to some fascinating places. I was really pleased to be up the Aiguille du Midi on the last day. Hi Rich – we really enjoyed the course. I really like James as a guide – he was sensitive to the needs of the group and was able to give me confidence and pace what I needed and was just a generally nice guy to lead us around. We hired from Praz Sports and had no problems. All the other organisation was fine. On the ski touring skills weekend we cover all the skills required to join a multiday ski tour as a safe member of a group. Techniques covered include skinning skills, uphill kick turns, transceiver training and avalanche safety and avoidance. Tips and coaching to improve your off piste skiing also form an important part of the weekend. 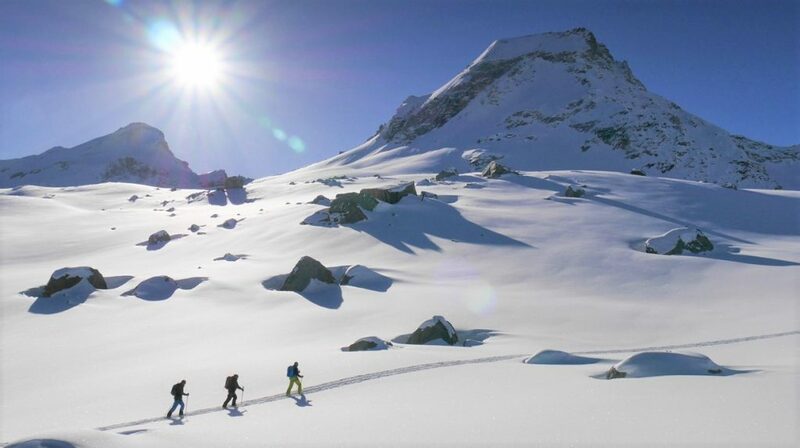 We tailor each course to your future plans and ambitions, so glacier travel and using ice axe and crampons may also be included if appropriate. 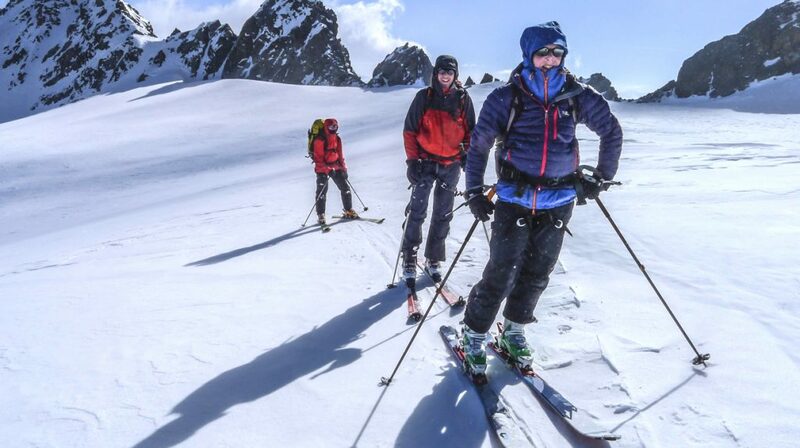 Teaching and training sessions are always incorporated into ‘real’ days out ski touring, so that you get to do as much skiing as possible over the weekend. This is an to introductory level trip. To take part you should be at Fitness Level 2 and Tech Level 2 (see our Fitness/Experience guidelines). 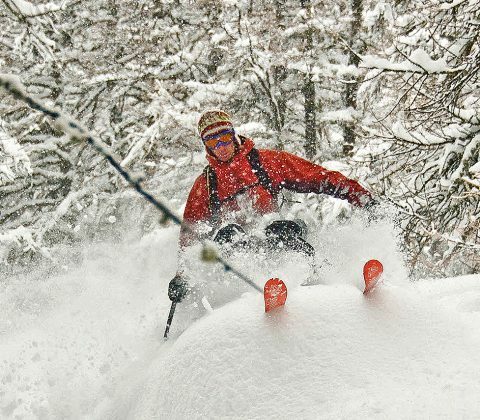 You need to be a regular off piste skier, but no previous ski touring experience is necessary. Our base and meeting point is the Hotel de La Couronne in the alpine village of Argentiere, 15 mins from Chamonix. The Couronne is a friendly place in the centre of the village, close to ski hire shops, bars, restaurants and bakeries, and within walking distance of the famous Grand Montets ski area. Rooms are provided on a twin (or occasionally triple or quad) sharing basis, but if you wish to book a single room please let us know and we will confirm availability. Evening meals can be taken in Argentiere in the hotels partner restaurant. NB in busy seasons we may use an alternative hotel as our course base, eg La Chaumiere Mountain Lodge, L’Eden and Cremerie du Glacier are some of our other regular hotels in Chamonix. Hotel details can be found on our Accommodation page. Return Flights – Please book a late flight on Sunday night (ie after 9pm) in order to allow for a full days skiing on Sunday. You should arrange outward travel to arrive at your accommodation on Thursday Evening. AM Morning Briefing. Your guide will run through kit checks and safety routines, as well as hand out any rental equipment, before going on to discuss the current weather and mountain conditions and how these affect our plans. 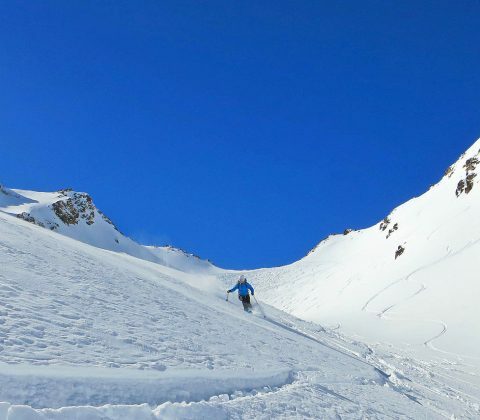 On day one, we start with some warm up runs and an introduction to ski touring kit, before practicing skinning skills, kick turns and doing some avalanche transceiver training, then we set off on a lift assisted day tour. Knowing how to skin uphill is pretty fundamental to all types of backcountry skiing away from resorts. Once you’ve got the basics of how to put skins on and off and how the ski touring bindings swap over from uphill to downhill mode, then it’s time to head off and practice some skinning. The technique is to slide your skis along the snow in smooth strides – ie don’t lift them up off the ground with each step – it’s more of a ‘shuffle’ than a ‘walk’. As the terrain gets steeper, eventually uphill kick turns are needed to change direction. These are difficult to master, but it’s important to practice them until you become proficient, as they are your ticket to travelling through the high mountains. In icy conditions, harscheisen (ski crampons) may also be needed for extra grip. There are different spacing protocols for travelling on terrain such as glaciers and steeper slopes, in order to reduce the loading on the slope – so it’s important you know how and when to spread out within a group. We’ll choose a tour appropriate to the level of the group, so that nobody struggles and everyone has the time to learn new skills and ask questions etc en route. You’ll need to bring a packed lunch, as we’ll be out in the backcountry all day, enjoying the skiing and scenery. Avalanches are the number one cause of serious accidents to backcountry skiers, so it’s essential that you know how to plan a safe day in the light of the current avalanche forecast, as well as make observations and ski defensively on the ground. This is an area that we discuss constantly throughout the course, both at a planning level and during each day out – on the way up and on the way down. Danger signs to look out for, how to select a safe route, skin up safely and then back down again in a way that minimises risk are all covered, as well as emergency procedures and avalanche rescue. Having all the skills and knowledge is one thing, but being aware of how group dynamics, peer pressures and other psychological factors cause people to make poor decisions in avalanche terrain is equally important, so we teach strategies to avoid these heuristic traps and improve your decision making. If you are involved in or witness an avalanche incident, you only have 15 minutes to locate and dig out any buried victims, in order for them to stand a realistic chance of survival. This is no easy task, so training and practice in how to carry out a coordinated avalanche rescue is vital for you to stand any chance of success. Knowing how to protect the rescuers, coordinate a group search, divide up jobs, do a final pin point search, probe for the victim and finally, undertake a coordinated conveyer belt dig out are all essential skills needed to cut the rescue time down to 15 minutes. Glacier skiing is a wonderful experience, but one that brings it’s own hazards. In order to travel safely across a glacier on skis, you need to know how to move correctly as a group and find a safe line through crevasses. Carrying the right kit is equally important, so we’ll show you what you need to carry on your harness and in your rucsac, including how to set up a ‘cowstail’ to make recue from a crevasse easier. It’s important to know how to conduct a safe descent, including the need for extra caution and control on glaciated terrain. In poor visibility or heavily crevassed terrain, you may even need to ski roped up – this is something you definitely need to practice before trying it for real. Tours are planned to involve as wide a variety of terrain as possible, including glaciers and using ice axe and crampons if appropriate. Tips and coaching to improve your off piste skiing also form part of the course. Course debrief and advice for the future. If you are flying home on Sunday evening, then you must book a late evening flight. ie on Sunday it won’t be possible for you to leave the group early and ski to the valley on your own, as we will be out on a ski tour in the middle of nowhere and will all need to stick together until the end of the day! Typically we are back at the hotel by 4-5pm latest, so book a flight departing after 9-10pm.